Unisex Designer Tribal Necklace : LOVE2HAVE in the UK! A designer tribal necklace for men and women. Since we began trading, we have noticed how more and more of our customers have become interested in silver tribal jewellery design - whether it be ancient Celtic, Aztec or something else. We are sure the reason is that being tribal in design this type of jewellery can give the wearer a sense of belonging in a spiritual sense to something earthy. 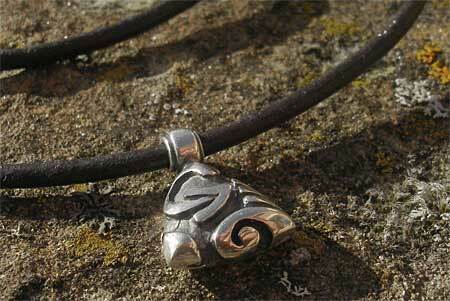 This tribal necklace is a designer silver pendant threaded onto a black leather necklace. 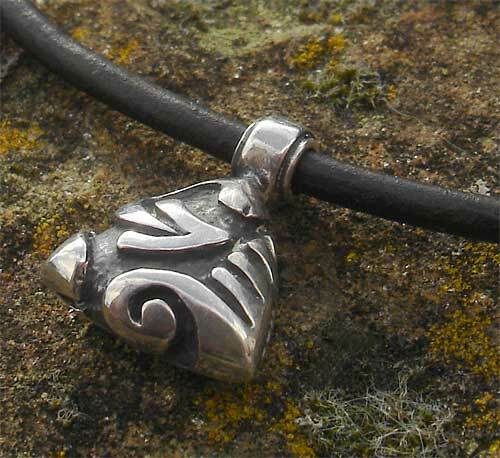 The pendant is a rounded triangular shaped style and is etched deeply with a tribal design. It comes finished in black oxidised sterling silver and measures approximately 10mm in height and comes with an 18-inch black leather necklace. Metal(s)/Material(s) Available: 925 oxidised sterling silver. Vegan non-leather also available.